BREAKTHROUGH UPGRADE: one key to lock/unlock screen. also designed with Independent Volume Control, Give you a more user-friendly experience .You can Switch songs or adjust the vol by our IN-Line control earphone, with 1.1 oz mini size body, Perfect for your outdoor and gym fitness. - 70 HOURS PLAY AND MORE: 70 hours audio playback, only need to charge it for 3-4 hours. You can charge it in computer or with the general charger which output is "5V, 0.5-1A" - EASY TO USE:Just drag and drop the music file or folder directly when connecting to computer, Shuffle favorite songs in any folder or playlist which you selected, Simply Sync playlists by Media Go(for free) on your computer,Works perfectly with Car via AUX port. (Additional male to male AUX cable is needed). BLUETOOTH FUNCTION: Supports Bluetooth version 2.1 and above, you can play the music through Bluetooth speaker or Bluetooth headset. Bluetooth mode is compatible with cars of 0000 PIN code (not with random PIN). DESIGNED FOR SPORTS: Mini and super lightweight only 0.88oz. Comes with strong wearable clip and sweatproof silicone case, doing exercise without any trouble. HIFI-CLASS AUDIO PLAYER: Supports music formats: MP3/WMA/OGG/APE/FLAC/WAV/AAC-LC/ACELP. Also supports FM Radio, voice recording and File browser. EASY TO USE: Bright user interface with 1.5in TFT screen display. Independent volume control and switch button make navigation more intuitive. 2000 SONGS AND MORE: 8 GB capacity and expandable up to 64GB micro SD card( not included). Compatible with bluetooth 4.0 or higher. BORN FOR SPORTS: Small size and super lightweight with wearable clip. BEST PRICING. We stand behind our products. 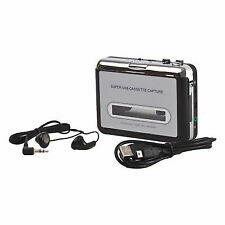 AGPTEK MP3 Player W/ FM Radio. Here's the details Very easy to use. The player designed with FM / Music switch slider and repeat / shuffle mode switch slider. Lightweight design only weights 13.8g; super easy to upload files onto the clip player, plug it into your PC with the enclosed USB lead and then drag files onto it. I don't know if it works. The screen turned on for a second and shut back off. Maybe a bad charging port or battery?. This way I know that you are satisfied with your order. 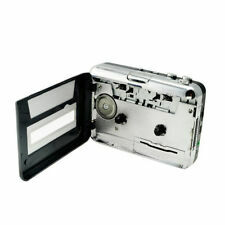 With the Tape to PC Recorder USB Walkman Cassette Player, you can convert all those cassettes into digital MP3 files. Want to experience the music as it actually sounded in the 80s?. 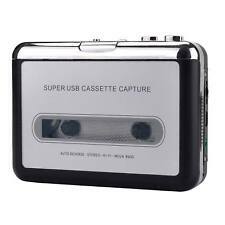 This nifty gadget can also play cassettes to give you that déjà-vu experience. 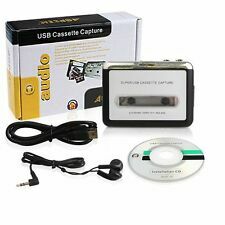 Wireless MP3 player with Bluetooth Functions you can access under Bluetooth mode; 1. It allows you to play songs by playlist,album and artist under Bluetooth status which enables you quick selection. Bluetooth 2.1 Wireless Transmission. Easy use both indoor and outdoor and assures pleasant wireless music playing experience via Bluetooth. You can play the music through Bluetooth speaker or Bluetooth headset. Bluetooth mode is compatible with cars of 0000 PIN code (not with random PIN). Lightweight with wearable clip and sweatproof silicone case, you can just hooked it to your pocket or blouse and enjoy music when running, jogging, riding, hiking or doing other exercise without any trouble. Audio format supported MP3/WMA/APE/FLAC/WAV.You can access to the music world. Support FM Radio, voice/FM recording, shuffle, folder view. 8 GB internal capacity and slot up to 128GB Micro SD Card( not included), which allows you enjoying music up to 4000. 1 x AGPTEK Voice Recorder. Transfer Easily: Just drag and drop your files between the voice recorder and MAC or PC via USB cable. High Quality Recording: Up to 1536kpbs PCM Lossless Recording. - Easily drag and drop your files to MAC or PC. 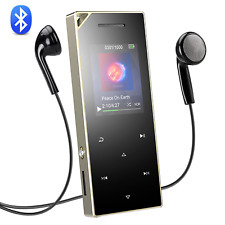 AGPTEK Bluetooth 8GB MP3 Music Player. With the little clip, it can be clipped to your armband/ cloth/ pants. Bluetooth function makes you free from worry about tangle cables. 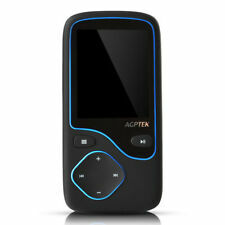 1 x AGPTEK A26 Bluetooth MP3 player. AGPTEK G15 16GB Bluetooth 4.0 MP3 Player Supports Playlist FM Radio, Blue. 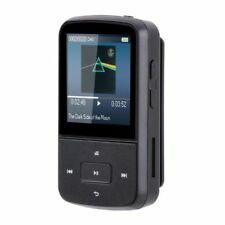 AGPTEK G15 16GB Clip Bluetooth MP3 Player is a breakthrough product, adopting advanced Bluetooth 4.0 version. Compatible with wider HD HiFi sound, brings an unprecedented musical experience. Unique Design:2.4" HD full touch screen&intuitive UI interface allows responsive touch/swipe control&easy navigation, support picture and video watching. Wireless Bluetooth 4.0:Enable fast and stable transmission both indoor and outdoor.Support Bluetooth background playback,fast forward/backward,listening radio via Bluetooth,playing from playlist.Connect seamlessly with all Bluetooth Speaker and Headphones up to 10 meters. Versatile Player:More than play music,it supports multimedia like radio,e-Book,video(240*320AVI/AMV) and pictures(slide show),which will meet your daily needs of entertainment.Besides,recording,stopwatch,alarm clock, and calendar functions are added for your convenience. Enjoy up to 48H of playtime via wired headphones at medium volume and 16H of playtime via Bluetooth. Video format: RM, RMVB, AVI, DIVX, MKV, MOV, HDMOV, MP4, M4V, PMP, AVC, FLV, VOB, MPG, DAT, MPEG, TS, TP, M2TS, WMV (H.264, H.263, WMV9/VC-1, MPEG1/2/4). Audio format: MP3, WMA, OGG, AAC, FLAC, APE, AC3, ATRA. AGPTEK MP3 player bring you beyond imagination stereo sound feeling, with a foolproof operation that has all main functions visible at a glance. Ideal music patner for adults and kids.Genuine AGPTEK Product. Works great, used this before I upgraded my phone. A little bit of the plastic on the back has worn off. HD 1080P output via built-in HDMI for HD movies and sound. Supports NTSC/PAL composite video, VGA 720P, HDMI 720P, 1080P high definition video output. Support H.264 (MKV, MOV, AVI) decode up to 1080p, WMV9/VC-1 up to 1080p.